I will be getting a OWC raid drive, https://eshop.macsales.com/item/Other World Computing/MED3FR7T08.0/, and Id like to move the backup set thats on a single ext drive to the raid. I have version Ret 9.01 (401) and mac os 10.11.6. I have currently one BU set named SFA 3 that uses a 4T ext drive (single drive OWC). ( I have other sets as well, using DVD and DDS3, ya they are old). I dont want to add any data from those old sets. And Id like to move SFA 3 to the new raid drive im getting. I think it should be easy, but maybe you could outline the procedure. I do not want to keep the BU set SFA 3 on the single drive, Ill use that for another purpose. My goal is to have the raid in mode 1 for mirroring, for safety. Its a 8T raid (4T storage capacity). bradp015 got an answer by first making this post in the Server, SBS and Multi Server forum. His Retrospect Mac 9 success report, including methodology, is 2 posts below it. Thank you for your help, it's really made things much easier! I still have my old back up set on the old drive. The new raid drive is in service, but since its new it doesnt have my complete trust. That said, Im thinking maybe Id like to have my backups go also to the old single drive AND the new drive. I have the set already there and Iv copied the new backup files (since i moved the set to the new raid) over to the old drive so both are identical. Q: Is there a way to utilize the old drive set as a "SAFE" set? If I change its folder name and append SAFE to it, can i then in RET. create a new bu set to point to it. (well, yes i think, as iv done that) but how do i tell RET. that it has data? I see "rebuild" there and have gone thru a few dialog pages, but then I get cold feet cause ya know, I dont really know what im doing in there. I think i get the idea but i better post here before i jump off the cliff. (If i screw up, I really dont want to copy the raid bu set back to the single drive to try again, its slooooow). And i dont want to kill my real raid bu set my mistake. First, on your old single drive, you need to rename the folder inside your Retrospect folder to WhateverItIsSAFE. Then you need to rename the folder inside that to 1-WhateverItIsSAFE. Finally you need to create a new Media Set (only benighted users of Retrospect Windows have Backup Sets, sneer, sneer ) named WhateverItIsSAFE, and add as its first (and I presume only) Member 1-WhateverItIsSAFE on the old single drive. The procedure is described starting on page 99 of the Retrospect Mac 10 User's Guide (I can't cite the equivalent page in the Retrospect Mac 9 UG because that's only an Addendum to the Retrospect Mac 8 UG). If you have already defined a Media Set named WhateverItIsSAFE, you should instead Rebuild it—as described starting on page 213 of the Retrospect Mac 10 UG—and add 1-WhateverItIsSAFE on the old single drive as its first (and I presume only) Member. First, on your old single drive, you need to rename the folder inside your Retrospect folder to WhateverItIsSAFE. Then you need to rename the folder inside that to 1-WhateverItIsSAFE. Finally you need to create a new Media Set (only benighted users of Retrospect Windows have Backup Sets, sneer, sneer ) named WhateverItIsSAFE, and add as its first (and I presume only) Member 1-WhateverItIsSAFE on the old single drive. The procedure is described starting on page 99 of the Retrospect Mac 10 User's Guide (I can't cite the equivalent page in the Retrospect Mac 9 UG because that's only an Addendum to the Retrospect Mac 8 UG). If you have already defined a Media Set named WhateverItIsSAFE, you should instead Rebuild it—as described on starting on page 213 of the Retrospect Mac 10 UG—and add 1-WhateverItIsSAFE on the old single drive as its first (and I presume only) Member. Ill give that a try. I add the BU set (media set, ya 😉 ) SFA 3SAFE in RET, its asked to add a member. I choose the deepest level folder which is 1-SFA 3SAFE that's in the RET folder on single drive. (retrospect/SFA 3SAFE/1-SFA 3SAFE). If i go into that folder I see what looks like the whole directory path as a duplicate. So I get: retrospect/SFA 3SAFE/1-SFA 3SAFE/retrospect/SFA 3SAFE. So it's adding the member directory INSIDE the folder that contains all the backup files (AA000001-AA002569). Its like its not recognizing the media set 1-XXXXX as being the actual media set. And I notice that it is not prefixing the media set with "1-" out of curiosity. (Like was instructed above) To clarify Im choosing "disk" when I create media set. The next thing I tried was choosing the enclosing folder for the dir. structure and I got an error mess. "the disk has data from another set"
Now Im thinking if i create the media set and get the empty folders. Then move all the backup files into the newly created directory, rebuild the cat. Would that solve my problem? Let me add after moving the contents of the media set to the new media set folder, doing rebuild two things are questioned. 2. when clicking rebuild i get a dialog asking if i want to replace the set. And you can see Iv made a folder to contain the new backup catalog in the main SAFE folder. Because the member name has the same name as my real raid bu, im concerned about clicking rebuild when i asks to "replace". Again, i "think" i understand whats going on, but im not 100% that i wont destroy something that i cannot live without. (yes, i have backups of the catalogs.) I hope I explained all in a thorough way here. 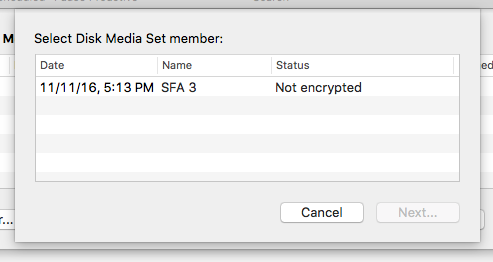 I made a mistake in my preceding instructions, by not properly considering what would happen if you Added a Media Set named SFA 3SAFE—in which case Retrospect Mac would automatically prompt you to add a folder named 1-SFA 3SAFE in a way that would be difficult to bypass. However I made a bigger mistake by not realizing that, as shown by your casual disregard of the terminology in effect since Retrospect Mac 9 was released in 2011, your ability to improvise exceeds your ability to carefully read the Retrospect Mac 10 UG. First, make sure that there is nothing underneath the 4T HD -> SFA 3SAFE 4t 111116 -> Retrospect folder on your single external drive 4T HD. That assumes you have previously moved or copied the 1-SFA 3SAFE folder containing the files with names ending in .rdb to underneath the 4T HD -> SFA 3SAFE -> Retrospect -> SFA 3SAFE folder you created . Second, Add a new Media Set named SFA 3SAFE, with its catalog in the default location root -> Library -> Application Support -> Retrospect -> Catalogs. If there's already a Media Set with that name, use the Finder to delete it and repeat the Add. When Retrospect automatically prompts you to add the first member to a Disk Media Set, per the dialog on page 102 of the Retrospect Mac 10 UG, specify the location 4T HD -> SFA 3SAFE 4t 111116. Don't worry, it will take into account the fact that the Retrospect folder is already there. This should give you a 4T HD -> SFA 3SAFE 4t 111116 -> Retrospect -> SFA 3SAFE -> 1-SFA 3SAFE folder with nothing in it. Third, copy the the 1-SFA 3SAFE folder containing the files with names ending in .rdb from underneath the 4T HD -> SFA 3SAFE -> Retrospect -> SFA 3SAFE folder you created within the SFA 3SAFE folder into the 4T HD -> SFA 3SAFE 4t 111116 -> Retrospect -> SFA 3SAFE folder. The Finder will ask if you want to replace the existing folder (which has nothing in it); do so. Fourth, to be on the safe side , follow the instructions starting on page 213 of the Retrospect Mac 10 UG to Rebuild the Media Set named SFA 3SAFE. In step 4 on page 214, navigate to the 4T HD -> SFA 3SAFE 4t 111116 -> Retrospect -> SFA 3SAFE -> 1-SFA 3SAFE folder. Then do steps 5 and 6, and skip step 7. Finally click the Rebuild button, letting the catalog location default to root -> Library -> Application Support -> Retrospect -> Catalogs. After the Rebuild completes and is shown as successful, delete your new SFA 3 SAFE folder that is directly underneath 4T HD, which should delete the folders within it. That will include the SFA 3SSAFE catalog folder; it is contrary to the way Retrospect works to put a Media Set catalog on an external drive that also contains the Media Set's Members. P.S. : When Retrospect Windows 7.5 was released in 2006, it added the the Disk type of Backup Set—which allows the Catalog File to be on a different disk from any of the Members. Because transportable disk drives still had low capacity, the assumption was that the transportable disk backup drive would contain only one or more Members instead of an additional slew of other folders and files. That's why, as the dialog on page 102 of the Retrospect Mac 10 UG shows, the Retrospect procedure for adding a Member assumes that its location will be designated as a particular disk drive top-level folder—not a folder below the top level as you have done. Retrospect Mac 9 still works when you do that, but—as you have found out—the complications can be daunting to the administrator. David, thank you for your help. I have gone thru and completed the steps outlined, reading in detail the manual. On completion of the steps it is shown that i get something that I wasnt expecting. On page 214 of the retro 10 manual I found it odd that the name of the backup media set was the original SFA 3 and not SFA 3SAFE. I had noted this in a past post because I wasnt sure if it was referring to the media set I now have on the raid drive. I decided to post this before clicking rebuild because i didnt want to screw my new location of the set on the raid drive. This time having clicked rebuild per instructions at the end of the rebuild i get a dialog saying an error and that, in my estimation, the name of the media set is somehow coded into the media set and is not dependent on the folder names you create in ret. (for the new SAFE set) When looking at the amount of data in the set SFA 3SAFE, I see that the set is empty without any files. (apologies for not having a screenshot)Here's the dialog error followed by the log text. Perhaps i should either invest in upgrading to the latest version (if it will solve my problem) or abandon the idea of having my backups on three drives for peace of mind. Id just start backing up data to the 3rd single drive from now into the future. The other idea I might investigate (from my limited knowledge) is to do a COPY of the media set to the single drive. I was hoping I could skip the 15 hour copy having experienced it once already. Maybe there just is no way to work the architecture of retrospect to complete the shortcut of just using the single drive existing data, morphing it into the different catalog. I'm sorry my latest suggestion didn't work. It looks as if the name of the Media Set may be coded into each .rdb file in the 1-SFA 3SAFE folder. I'll skip trying to debug or work around that problem, and go straight to an easy-to-use-on-a-continuing-basis version of your COPY alternative. The basic idea is that, once you do a single Copy Media Set run, which may take 15 hours for you, you can keep two Media Sets in sync by doing routine Copy Backup runs—which will take much less time. The idea is most succinctly described in the "Create synthetic full backups" paragraph in this Wikipedia article subsection (think Media Set whenever you see "archive file"; another editor forced DovidBenAvraham to use the latter term because it is application-independent). Based on what you have previously written in this thread about safety, I think you will want to use your single external OWC drive for the Media Set that is the destination for your Backup script runs—and then do Copy script runs with that Media Set as the source and a differently-named Media Set on your RAID drive as the destination. Copy Media Set is described (including an intro) on pages 153-155 of the Retrospect Mac 10 User's Guide. Copy Backup is described on pages 156-158 of that same UG (somebody at Roxio made a mistake and left the Copy Backup section out of the Table of Contents for that UG version). A word of caution: If you are running any Server version of Retrospect Mac, or if you upgrade to the Desktop or Solo Edition of Retrospect Mac 15, make sure your Backup and Copy scripts are running in the same "activity thread"; activity threads are discussed on pages 121 and 179 and 252 of that same UG. I found out nearly two years ago from the head of Retrospect Technical Support, after I ran an experiment overlapping a Copy Media Set script run with a Backup script run, that Copy scripts use the Catalog File—which is only updated at the end of a Backup script run. I then made a Product Suggestion—both in a thread and in a Support Request—that would allow overlapping without omitting copying of the latest files backed up, but Retrospect Inc. has not acted upon that suggestion. Seeing there is no way to use existing backup data with a new SAFE media set, I think the best option is your suggestion "copy media set". I did try to reverse engineer the catalog/media set to use my existing "single drive" data, but as you said, the backup set title "SFA 3" must be encoded into all the backup files and therefor cannot be repurposed to create my desire for a second Safety destination on the single drive. After getting boxed into a corner I replaced the catalogs and the "backup media" file that appears in the set (under folder "retrospect") with the originals and was let out of my corner. All is functioning correctly now after a bit of panic. (while trying to change the member back to the raid drive, ret. was giving me "an error occurred" and wouldn't let me point to my raid set. It was now pointed to the orig set on the single drive.) This leads me to believe that the architecture of media sets and destination files are more that meets the eye in the way they "work' with each other. It's like the "name" of the media set that you 'see' has no baring on what is actually is happening. So enough confusion. Ill take your suggestion to just do the media set copy over to the single drive. (id rather have my 'actual' set on the raid and do weekly "media copies" to the single drive. Also Thanks for the clarification on the "activity sets". I realize that all of this started with my wish to not have to copy another 15 hours, but as long as i can get a solution i dont mind another 15hr copy. I just wanted to finalize this topic incase someone is trying to do this in the future. After setting up a "copy media set" script with the single 4T drive (to have my complete media set on another drive a side from the new raid drive) I did the copy. It took about a day to almost complete. I neglected to set the "size" of the disk member to be enough to copy the whole media set so it stopped and asked for a new member. I did reset the size to be sufficient and started the copy script. 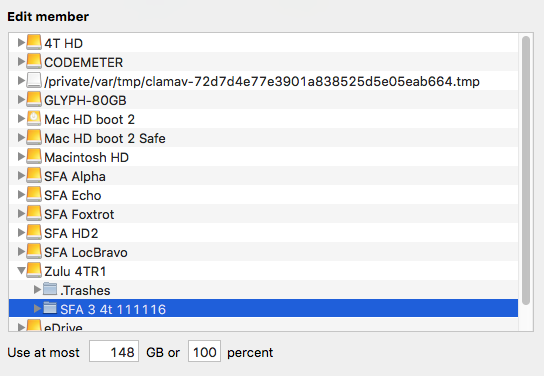 After an hour of "matching" I see that doing a copy of a media set this size (1.5 TB ish) the matching task seems to take much longer than I had assumed. I would of thought that the matching task would be sim to my normal backup activities which is pretty quick. Now I would think that the matching task will prob. take much longer than is feasible and Im going to abandon the idea of having my SAFE copy on another drive. I think it would much quicker to just copy the added individual files that are in the media set from the raid drive to the safe drive. Which to me seems kind of odd. If Im mistaken on the time it takes for RET to do the matching task, pls notify me. Perhaps Im doing something wrong or incorrectly. Thank everyone for all the help you have given me. Its much appreciated! To prevent the "matching" that is slowing down your Copy Media Set script, de-select the Match source files against the Media Set and Don’t add duplicate files to the Media Set options. These are described on pages 113-114 of the Retrospect Mac 10 UG, but are also shown in the dialog on page 155. The Roxio genius who wrote the Retrospect Mac 9 UG evidently didn't want to tire his/her fingers describing these options a second time, so he/she simply referred back to the descriptions for Backup scripts—where the options serve a fundamentally different function. You may want to to select those options for your Copy Backup script; although doing so will slow down your periodic executions of that script—which are likely to take considerably less time. Sorry I forgot to mention de-selecting those options ; it's been nearly 2 years since I experimented with a Copy Media Set script. I do think I should post this as a new topic, but you have a good understanding of what Iv been doing. I hope you have some insight. On my new raid media set Iv been backing up without any issues. Today, I noticed the word "deferred" in the date portion in the activities page. It also appears on the "modified" column in the scripts page. I checked to see the settings of the raid drive member in media set page. In the size options Im seeing 148GB and 100%. This raid is a 8T raid which is 4T avail. (select the media set then select the member and click the pencil tool) i reset it to 3750gb and 100% and try the backup again. It still says "deferred". Iv included picts.It does appear to be writing the backups. I have restored files that were backed up while seeing the "deferred" status. So they ARE being backup up. As to the ""deferred" issue, see this post today by the head of Retrospect Tech Support. As I understand it—including the linked-to Knowledge Base article, the idea is that administrators running Retrospect Mac versions 12.5-14.6 should download the .DMG file linked-to in the KB article and install the 14.6.2 Console from it. It appears that it wouldn't work for the Retrospect Mac 9 Engine, which is what you say you are running. Maybe you can contact Retrospect Sales, and work out a deal to upgrade to Retrospect Mac 12.5 for a lower price than upgrading to 15.6.1. You fail to understand the overall idea, which is that you will run a Copy Media Set script once and then run a Copy Backup script daily. I don't have time to write a post describing the procedure just for you, but here is a post I made in September 2016 describing a superset of that procedure—one for creating and maintaining a running copy in the cloud of backups to a local Media Set. In steps 1) through 6), ignore anything concerning Grooming or a cloud account—which means you can essentially convert steps 3) and 4) into whatever it takes to set up you new local duplicate-of-the-original Media Set. In both steps 5) and 6), don't check No Verification unless you like living dangerously (cloud providers are supposed to have such error prevention that lengthy-and-expensive verification isn't necessary). Ignore step 7). David, You are correct, I wasnt aware of the whole idea. Thanks for clarifying. I do have my old media set on the drive but even with it there, should be plenty of room for the new safe set im trying to do. (as per your instructions). I would be open to deleting all files (my very original media set i had on this single drive) on the 4TB HD and start over if that is the problem. I have learned quite a bit here but maybe Im still lacking some understanding. So to recap: Im still having trouble getting the initial "copy media set" task to complete. I have not clicked stop on the current copy media set script in case there's something I can do before i stop it. When I click "choose media" in the summary page I get an empty retrospect folder (without it listing the contents of "retrospect" folder in the directory. Which is not right since I can see the directory path in the finder. (see attachment) If I select the 4T HD or retrospect folder and click ok, nothing happens. And I see that "use at most" is back to a lower number than originally set. (the number and percentage seem to change every time i open that folder. I don't have any production experience with Copy Media Set; I've only used it in some tests. What I would suggest is that you use the Finder to look in the Retrospect folder (I hope you have only one) on your drive "4T HD", and see if you now have a "1-SFA 3" folder within that. If not, keep the Retrospect folder selected and click the Add button in the dialog. I had occasion this morning to completely Rebuild two Media Sets in Retrospect Mac 15.6.1.105 using the existing "1-Media Set Whatever" folders. IIRC clicking the disclosure arrow to the left of my Retrospect folders on the two external drives did not cause the contents of that folder to be shown in the Rebuild dialog. The Retrospect Mac interface for Copy Media Set also appears to be pretty funky, and appears to have basically originally been designed for a tape destination. I had occasion this morning to completely Rebuild two Media Sets in Retrospect Mac 15.6.1.105 using the existing "1-Media Set Whatever" folders. IIRC clicking the right-pointing arrow to the left of my Retrospect folders on the two external drives did not cause the contents of that folder to be shown in the Rebuild dialog. The Retrospect Mac interface for Copy Media Set appears to be pretty funky. David, thank you for all your help..... priceless! Are you saying that, inside your Retrospect folder on your drive "4T HD", you have two Media Set destination folders that each have a "1-..." folder inside—one destination folder named "SFA 3 Safe" and another named "SFA 3"? If so, no wonder you're getting the the "select new media" message near the end of the Copy Media Set run—there simply isn't enough free space left on the drive! If folder "SFA 3" contains 1.5TB, and folder "NO USE SFA3SAFE 4t 111116" also contains nearly 1.5TB, then when you Copy Media Set "SFA 3 Safe" to "4T HD" you'll hit nearly 4.5TB on a drive that has only 4TB capacity! To your reply, please attach a Finder screenshot of the contents of the Retrospect folder on your drive "4T HD" with all disclosure triangles clicked. IMHO you're going to have to rethink what backups you want on what drives. You've really only got one logical Media Set whose backup contents you want to save on two drives. I'm guessing you want to put an on-site copy on one of the drives in your new RAID —because the RAID enclosure isn't really portable, and an off-site copy on your "4T HD" drive—because that single drive is portable even if it won't quite fit in your pocket. Therefore—to allow for maximum expansion—the only folder you should end up with inside the Retrospect folder on your "4T HD" drive is one named "SFA 3"; you should have another Retrospect folder on a RAID drive containing a folder named "SFA 3 Safe". If you don't like the names for the Media Set destination folders on the two drives as I have proposed them, feel free to reverse the names. Let's assume for now that the "SFA 3 Safe" folder is the one to go on the RAID drive. 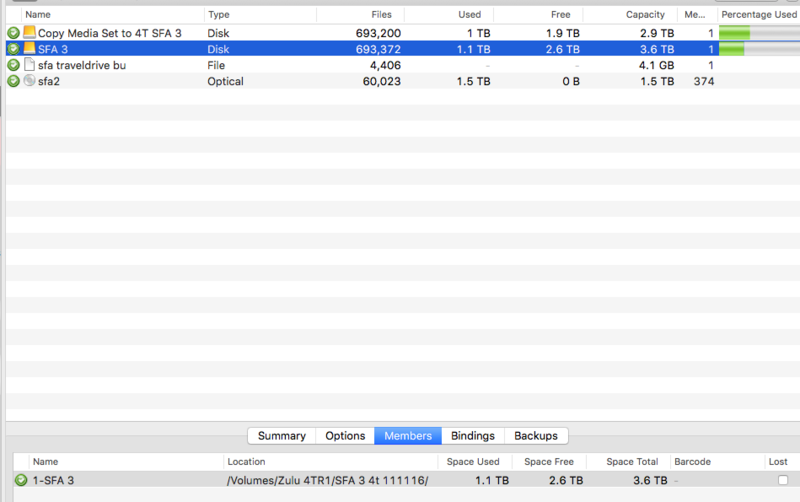 You should first Finder-move the "SFA 3 Safe" folder from inside the Retrospect folder on your "4T HD" drive, with its filled (with .rdb and—maybe .session files) "1-SFA 3 Safe" folder inside, either directly beneath "4T HD" or onto another drive—possibly the Desktop on your "backup server" computer—in which case you must Finder-delete the folder on your "4T HD" drive after you have Finder-copied it onto another drive. You should next use Retrospect to Remove the "SFA 3 Safe" Media Set. Following that you should Finder-delete the "SFA 3 Safe" Catalog File from wherever it is stored (probably in the default Library -> Applications Support -> Retrospect -> Catalogs folder on your "backup server" computer, then Empty Trash, and then use New to recreate the same "SFA 3 Safe" Media Set—with its Catalog File in the same folder from which you just Finder-deleted it and a a single Member on your chosen RAID drive. Finally you should Finder-copy the saved filled "SFA 3 Safe" into the Retrospect folder on your chosen RAID drive, allowing the Finder to replace the the newly-Retrospect-created "SFA 3 Safe" folder and its empty "1-SFA 3 Safe" folder inside, and then use Retrospect to Rebuild the "SFA 3 Safe" Media Set—locating its only Member again on the chosen RAID drive. 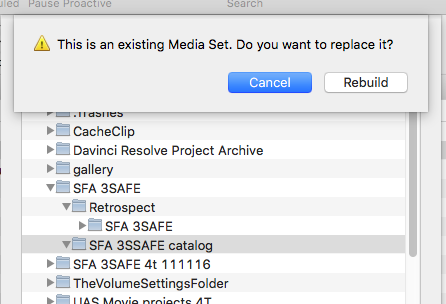 Whenever you are satisfied that everything is hunky-dory, you can Finder-delete the "SFA 3 Safe" folder from wherever you originally Finder-moved it, then click on the Retrospect pencil icon to expand the capacity of the "1-SFA 3" Member on your "4T HD" drive, and repeat the Copy Media Set with "SFA 3 Safe" as the source Media Set and the Member-expanded "SFA 3" as the destination Media Set. Trust me; this morning I did the analogous procedure to re-create 2 Media Sets that already existed, with "1-Media Set ..." folders that were already filled, on my portable backup drives. Be careful, and good luck! Added sentence to 1st paragraph showing how capacity of drive "4T HD" is exceeded; revised 3rd paragraph to ensure that no old copy of "SFA 3 Safe" folder is left inside the Retrospect folder on "4T HD"
1.16Tb: my old and original media set called SFA 3. this was the orig. set i wanted to transfer to the raid drive. (and i have with your help and Lennarts). All is good. I didnt delete yet cause of cold feet. but Iv renamed the top folder so ret wont find it by mistake. (NO USE SFA 3SAFE 4t 111116) The word SAFE appears because i am lazy and did not change it back to SFA 3 4t 111116. 1.15Tb: my new "copy media set" that im working now with your help. This is the script that stalls for new media. I name this SFA 3 SAFE. and it resides in the "retrospect" folder. Sorry, dont mean to not include my intentions. I wish to have ext RAID drive in service on site for daily backups. I wish to have INTernal 4T drive as the "OMG" the raid failed 100% my head is going to explode, in service on site as a redundant BU. I would like to do "copy backup" from Raid to 4T daily or weekly. The above size listings, to me, show that there is indeed enough space to copy the SFA 3 raid set (1.16tb) to the 4t HD which still has 1.7TB available. Yes?? And seeing that it has enough free space the copy media set should not stall for choose next media. I agree that it looks as if you have enough space on "4T HD" for another copy. The one thing that occurs to me is that you have two "Retrospect" folders on that drive. even though one of them is underneath the "NO USE SFA 3SAFE 4t 111116" folder. IME the parts of Retrospect that deal with creating Members on disk drives are programmed to either detect existing "Retrospect" folders or to create new ones. I'd hazard a guess that those parts get confused when there's more than one "Retrospect" folder on a drive. 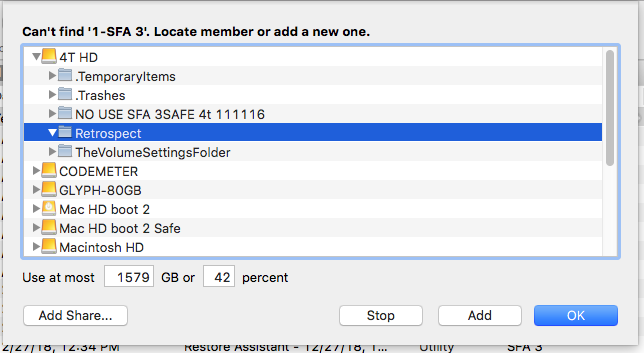 I'd suggest that you Finder-move the "SFA 3SAFE" folder that's two levels inside the "NO USE SFA 3SAFE 4t 111116" folder so that it—and its subsidiary "1-SFA 3SAFE" folder—are directly within the "NO USE SFA 3SAFE 4t 111116" folder, and then Finder-delete the "Retrospect" folder that the moved folder used to be underneath—along with the "Retrospect" folder's contained 0-byte "Backup Media" document. 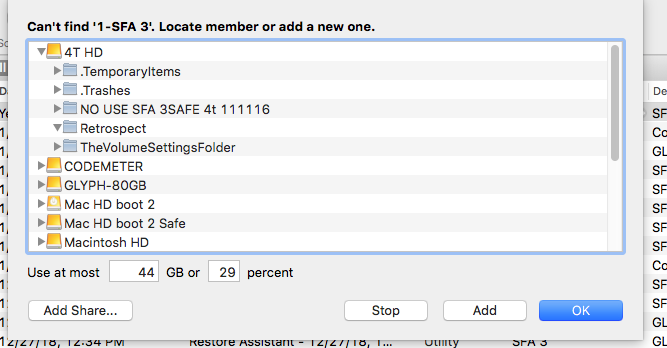 If you ever need to put the moved copy of the "SFA 3SAFE" folder back into action, you can first re-create a "Retrospect" folder and then Finder-move that "SFA 3SAFE" folder back inside it. Come to think of it, maybe the 0-byte "Backup Media" document is a marker to tell Retrospect that the "Retrospect" folder that contains it also contains a Media Set Member folder. If so, it would explain why Retrospect would get confused when it found more than one "Retrospect" folder containing a 0-byte "Backup Media" document on the same disk volume. Yes indeed, that's the sort of kludge I might have devised myself back when I was an applications programmer. David, thank you for the insight! I did wonder how smart the ret app would be. Iv run into this before in other apps. Yes, I agree that naming and in app coding may be confused. Moves and delete's you suggested completed. Now, Im pondering what to do next. Redo the whole 'copy media set' task (deleting the stalled run data first) OR run it again as is OR create a 'copy backup' script and run (with dont add dupes and match checked). Since 'copy media set' had almost finished most of the data is copied. Re running it without "dont add dupes' and 'match source media' checked (so in the unchecked state) would add to the whole set to the existing set i believe, doubling most of it. Since most of the set is already copied, to me, it makes sense to do a 'copy backup' run. yes???? No, don't do a Copy Backups, because it will only copy the most recent backup of each source unless you have specified a number of snapshots in your Grooming policy—per this 2016 post by a Retrospect Inc. employee. Unless your Copy Media Set run finished just before copying those backups, following up with a Copy Backups run will leave backups un-copied. Just delete the stalled-run data, Rebuild the destination Media Set, and run the whole 15-hour Copy Media Set again. Sorry to be the bearer of bad news.